Recently I managed to get my hands on a couple of samples of Witch Skincare and after posting a photo on Instagram I was kindly contacted by the PR rep for the company and sent some full sized products to try out. 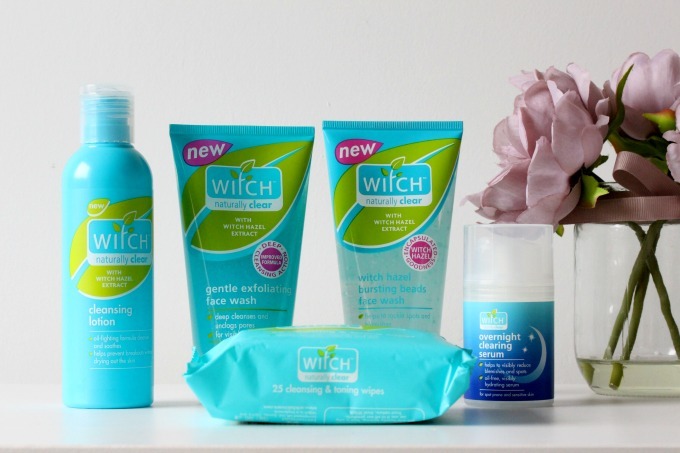 I’d never tried Witch before and honestly I had some reservations about how good they could be after hearing mixed reviews but I’ve been pleasantly surprised by the results and am now using these products on a daily basis. The first product that I have absolutely been loving is the Gentle Exfoliating Face Wash which I’ve found is one of my new favourite night time reaches. I’ve been using this daily to clean off the remains of my makeup and exfoliate my skin before bed. It’s the kind of scrub that I really like; It makes me feel like something is happening. I’ve said this before, but I’m really not much of a fan of face washes that don’t feel like they’re doing anything for your skin and this one definitely does as it has natural micro-granules that helps deep clean pores and leaves the skin feeling fresh and smooth. It’s also packed full of Witch Hazel (as are all of the brands products) and this naturally cleanses, tones and soothes; something that I really like. I love it when you get a slight tingle or stinging sensation from a face wash, it could mean nothing, but to me I feel that little bit cleaner and have been loving the results! The Naturally Clear Hazel Bursting Beads Face Wash is another that I’ve also enjoyed for more of a nourishing and gentle wash, this product has beads of Witch Hazel that burst when massaged into the skin to give a more focused release of goodness to clear skin. The product that I’ve been most impressed with has been the Naturally Clear Overnight Clearing Serum; this is actually the sample that I had shown on my Instagram and been loving in the mini bottle so I was extremely happy when I received the full version. I’ve been applying this before bed (after my usual cleansing routine) every night since and I feel like I’ve definitely seen a difference in my skin. I’ve been a bit hormonal recently (Jordan would probably say a lot) and so I’ve been seeing far more spots around my chin than normal but I feel like by concentrating this serum around these areas before bed has been calming them down a bit and at a much faster rate than they’d usually be retreating. I’ve never really had success with products like these before and so I’ve been very happy with these results. A couple of the other products that I’ve been loving lately are the Witch Skincare Cleansing Lotion and the Witch Concealer stick. I’ve found the cleansing lotion to be amazing at removing those extra stubborn bits of makeup like black eyeliner (why is that stuff so stubborn?!) and it’s also been leaving my skin feeling toned and smooth after use. I really love the concealer stick also and it’s pretty impressive considering Witch isn’t a makeup brand. The Concealer stick that I tried came in ‘natural’ which I believe is the first shade that they do, honestly I think it’s still a little bit too dark but mixed with my foundation / used when I have a slight fake tan, this is one of the best concealers I’ve tried in a while from a ‘drugstore’ brand. It’s pretty amazing at concealing (which is good since that’s its main job really) and it’s so inexpensive that I don’t really know why this product isn’t more widley coveted within the blogging community. In all honesty I never knew that Witch did a concealer, so I definitely think it’s one that they should start marketing a bit more because I’ll definitely be picking up more of these when this one runs out! I’m really really liking Witch skincare at the moment and I’m so happy I’ve been able to try out a couple of their products as I think their products are really underrated! Have you ever tried Witch Skincare products before? Previous Post How to Train Like an Animal!